Pole man Jonathan Rea paddled his way to victory by more than six seconds at a soaking wet Knockhill in race one of the British Superbikes Championship. The race was delayed by almost an hour to allow the conditions to improve from the torrential rain which had fallen until half an hour before the revised race start time. The race distance was also reduced to 24 laps because of the conditions. 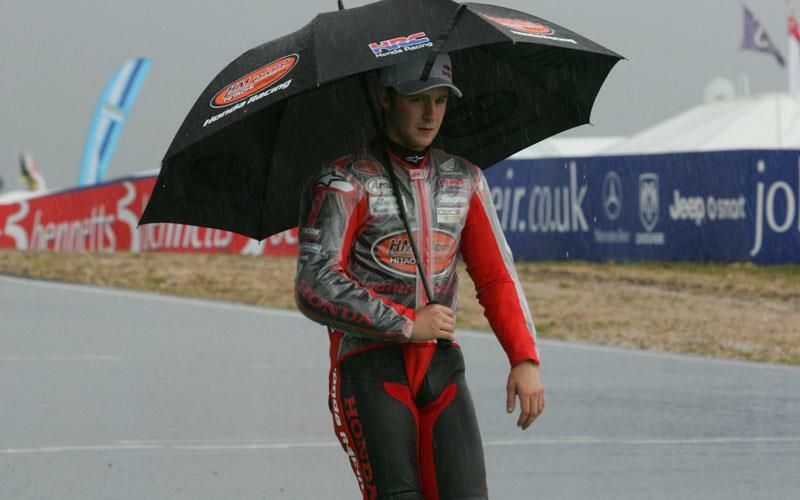 The rain held off until just before the chequered flag to allow the rider some chance of competitive racing with Jonathan Rea making the best of the poor conditions from the front row. HM Plant Honda rider Jonathan Rea led from the start of the race from teammate Ryuichi Kiyonari and had built a 0.773sec lead by the end of lap one. By lap four Jonathan Rea ws already 3.369secs ahead of Ryuichi Kiyonari as the rest of the field struggled with the spray. Bike Animal Honda’s Leon Camier was in third but fell victim to Airwaves Ducati's Leon Haslam’s determination for Haslan to go third on lap nine. Leon Camier fell at Scotsman on lap 10, giving Leon Haslam the chance to keep ahead of fourth placed Rizla Suzuki rider Chris Walker. Walker himself was relegated to fifth with fellow veteran Shane Byrne moving his Honda up to fourth on lap 14. While Jonathan Rea increased his lead to as much as five seconds at some points another rider to suffer under the wet conditions was Quay Garage Honda’s James Buckingham who also fell at Scotsman. Scott Smart (Hawk Kawasaki) who was struggling with bruising sustained in a crash with Virgin Yamaha's Tommy Hill in the warm-up and Neil Faulkner (Team Emco Yamaha) both retired to the pits. Jonathan Rea took the chequered flag with a 6.844sec lead from Ryuichi Kiyonari in a HM Plant Honda one-two with Leon Haslam two seconds further behind for the final place on the podium.